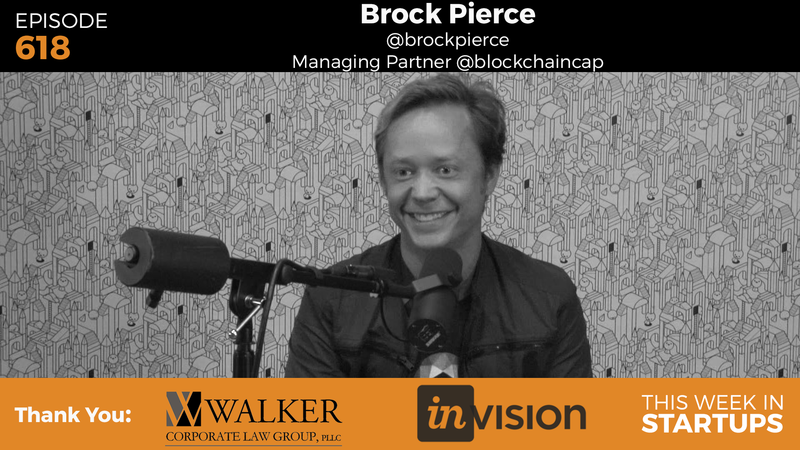 Today Jason sits down with Brock Pierce, Managing Partner at Blockchain Capital and Chairman of the Bitcoin Foundation. Together, they discuss blockchain protocol, bitcoin mining and scalability, innovative use cases, and the future of cryptocurrency. Throughout the episode, Jason asks Brock important questions about the technology and future of Bitcoin and blockchain; these answers provide insight into the cryptocurrency industry as a whole, and the huge potential it will have to change the world. In Episode 618 of This Week in Startups, Jason sits down with Brock Pierce, Managing Partner at Blockchain Capital and Chairman of the Bitcoin Foundation. Together, they discuss blockchain protocol, bitcoin mining and scalability, innovative use cases, and the future of cryptocurrency. Throughout the episode, Jason asks Brock important questions about the technology and future of Bitcoin and blockchain; these answers provide insight into the cryptocurrency industry as a whole, and the huge potential it will have to change the world. Here are some of Brock’s most salient answers, if you’re curious to learn more about Bitcoin and blockchain technology. What is the difference Bitcoin and blockchain technology? Why hasn’t Bitcoin become part of our day to day lives? Brock explains that for the most part, the technology and security solutions that Bitcoin provides aren’t necessarily big enough to change banking and financial behaviors in developed countries with stable currencies and trustworthy governments and banking systems. In countries or parts of the world that don’t have such services and systems, Bitcoin presents an opportunity to establish security and trust that isn’t currently there. Just because it isn’t being widely adopted in the U.S. doesn’t mean Bitcoin won’t change the way currency is exchanged in other parts of the world. Why do we need to have mining at all? Mining is integral to the trustlessness of the Bitcoin cryptocurrency, Brock says. While this may seem counterintuitive, the fact that you don’t have to trust the person you’re doing a transaction with (because the transaction is authenticated by ‘miners’ all over the globe) makes it a must more secure system. Just like reviews helped you feel better about not buying a fraudulent item on eBay, mining helps authenticate Bitcoin transactions so that everyone has access to the proof that they happened. Will Bitcoin be the primary cryptocurrency in the world in coming decades or will there be an alternative? Jason and Brock spend some time discussing several different cryptocurrencies including Ripple, Stellar, and Ethereum. Brock says that while many of these companies present great promise for helping transform currency-based transactions, Bitcoin has the advantage of being one of the oldest, which often makes a difference in how much trust a general consumer puts in using a product. It may not be the case that Bitcoin is the primary cryptocurrency in the future, but the fact that it’s older than most helps give it an advantage. What is the possibility of blockchain technology being used in other ways, such as voting or content authentication? Blockchain technology isn’t just good for authenticating financial transactions, as it’s currently used by Bitcoin: any transaction is actually far more secure when it is authenticated through blockchain technology. Jason and Brock spend some time talking about some examples, such as how voter fraud could be reduced, how content could be authenticated and attributed, and more. It’s cheesy to say, but when blockchain technology is widely adopted, the way we transact on the internet will change dramatically. Want to hear the whole conversation? The full episode with Brock Pierce, as well as past episodes are all available on This Week in Startups. 2:00–4:30: Jason and Brock discuss Blockchain technology and how Bitcoin is related. 7:00–11:33: Brock discusses Bitcoin scalability, transparency, and recent controversy in the news. 14:05–19:35: Jason asks Brock about how important it is that miners have a concentration in China, and why this is happening. 30:54–35:54: Jason asks Brock about Bitcoin’s prominence in the cryptocurrency industry, and competitors/alternatives. 37:11–39:33: Brock discusses the importance of Bitcoin mining. 39:34–41:07: Jason and Brock speak about the alternative uses for Bitcoin technology, such as in voting and content authentication. 52:50–56:31: Jason asks Brock about his concerns in the cryptocurrency industry, and what keeps him up at night. 58:30–62:14: Jason and Brock discuss the speed of technology, the wealth of information, and the future of AI and human interfaces.